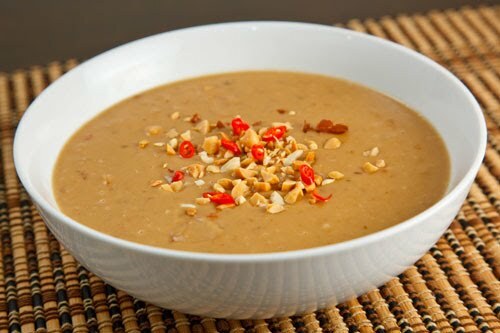 I learned to love peanut sauce (pindasaus) while living in The Netherlands. An Indonesian meal just isn’t right without it! This delicious sauce is a favorite of every member of our family. We use it most often to smother skewers of chicken (Satay Ajam) or pork (Satay Babi), over vegetables (Gado Gado), or with mayonnaise and diced onions to top frites (Patatje Oorlog). There are two kinds of people in the world; those who love peanut sauce, and those who haven’t eaten it often enough to crave it… yet! In saucepan, melt peanut butter; add garlic. Heat until texture is creamy. Add lemon juice and ketjap manis. Sauce will become quite thick. Stir in coconut milk, brown sugar, curry powder and sambal. For a slight variation, I will often add a couple of teaspoons of fresh ginger, or even a little lemon grass.